Apart from actually having Rabbit of course, doing up his nursery I think is the most exciting part of my pregnancy journey! 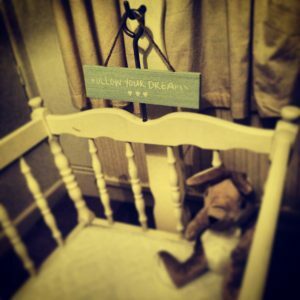 As soon as I found out that I was pregnant I took to Pinterest to compile a collection of ideas for my little Rabbits den. I found all sort of amazing DIY ideas that I can’t wait to get started on … but thats for another post! 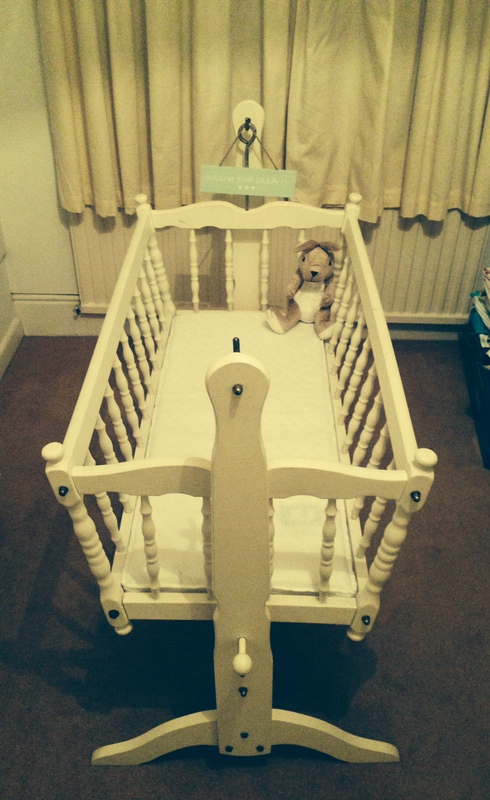 While thinking about the nursery I remembered that my mum had kept a swinging crib from when me and my siblings were babies, and that she had restored it for my nephew Reece when he was born. For reasons unbeknown to me my brother and sister in-law decided not to actually use it so it had sadly been sitting in the attic, all shiny and new looking with no baby to look adorable in it! When I asked my mum if I could use the swinging crib for little Rabbit her eyes lit up! This, in our eyes, is a family heirloom that was my brothers – now aged 36 then my sisters and then mine. To me that makes it like a million years old and so sentimental. The crib itself is in such fantastic condition, I guess a tiny baby can’t really do much wear and tear ay? with a lick of paint and a new mattress the swinging crib looks like new, but of course with a shabby chic kind of look that I love! I’m so in love with this crib, I wish it was something that Rabbit could use for longer. I guess we will just have to keep hold of it until we have another little bambino right!? I’m thinking of keeping it in our bedroom to start with. The cottage is on 3 floors so the moses basket stand can be downstairs, the crib in the nursery on the first floor and then the swinging crib in our room at the top. The swinging crib is the perfect size to put the moses basket into if Rabbit is already nice and settled in there so it should all work out perfectly! I can’t wait to see my little bambino in there and hope it brings back some lovely memories for my mum and dad! I like the helpful information you provide on your articles. I’ll bookmark your blog and take a look at once more here frequently. I am somewhat sure I’ll be told a lot of new stuff right here! Best of luck for the following!